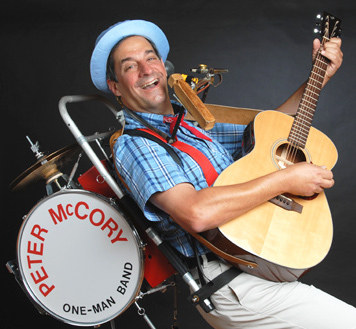 Peter McCory -- The One Man Band for KIDS! Meet Peter McCory... 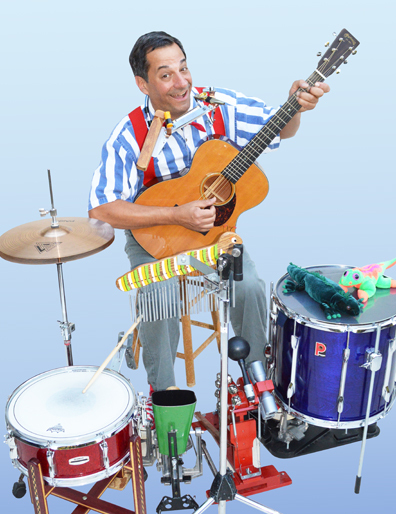 The One-Man Band For Kids and Families! 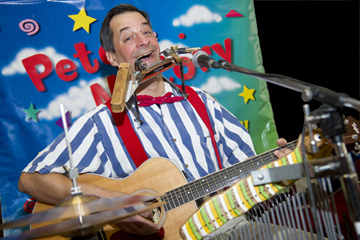 Peter McCory is the Washington, DC area's "One-Man Band for Kids and Familes!" 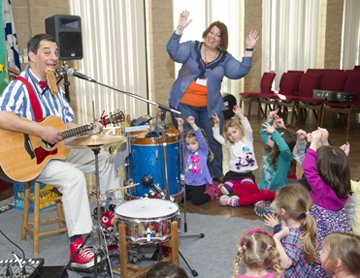 Since 1996 he's been playing music kids and parents love -- lively, upbeat renditions of familiar songs, folk songs, novelty numbers, and his own award-winning original music for kids. His shows are always interactive, which makes him a hit at any event and with any audience. What's a one-man band, you ask? Well, while strumming guitar, Peter's also playing harmonicas, kazoos and whistles. Then, with his feet he plays drums, cymbals, cow bell and other percussion instruments. And, on top of his own self-contained back-up band, he sings, whistles, yodels and scats. And he does all this at the same time, without any help from any electronic or computer-controlled instruments. Everything is completely acoustic. It takes a lot of coordination to sing and play all the band's instruments at the same time, but Peter loves it, and enjoys watching the reaction of the audience. The old-fashioned thrill of a real one-man band keeps kids and adults engaged, because it's fun to watch as well as listen to. Based in Warrenton, Virginia -- about 50 miles southwest of Washington, DC -- Peter shares his music wherever kids, families and adults gather for a good time. Wherever he goes, the music is always upbeat, postive and family-friendly. It's fun, but also educational! Kids learn about music and instruments, music from around the world, and even songwriting. Peter has won national acclaim for his three CD recordings of original children's music. They've won praise from national library journals and the Parents' Choice Foundation. This site updated April 3, 2019. All content on this website © 2019, Peter McCory.